Graphics mounted onto a substrate such as foam board, Gator board, etc. 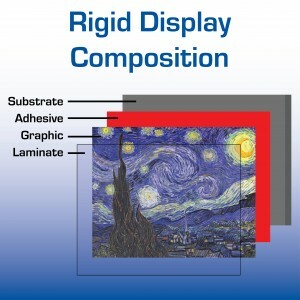 are formally known as rigid displays.Rigid displays typically consist of a four elements: the rigid substrate (board), an adhesive, the print, and an overlaminating film. Rigid displays are created in a two step process.First, a decal is made by simultaneously applying a laminating film to the face of a print and a mounting adhesive on the back. Pressure Sensitive laminating films and mounting adhesives are typically used together for this process. Next, the release liner is removed from the mounting adhesive and the decal is applied to the board. Mounting adhesives can also be used to pre-coat boards for mounting graphics at a later time. To create a pre-coated board, simply apply a mounting adhesive to a rigid substrate and trim off any excess material. Just prior to mounting, remove the release liner to expose the adhesive and adhere the image to the board by processing through a wide format laminator. D&K manufactures and recommends variety of mounting adhesives designed to work with different substrates and applications*. Standard Foam Boards: General foam core boards with clay coated paper surfaces. Plastic Surfaced & Corrugated Plastic Substrates: Duraplast™, Ultraboard™, etc. Expanded PVC Board: Sintra™, Komatex™, etc. Aluminum Faced Substrates” Exposed aluminum surfaces including DiBond™, Alucobest™, etc. Floors: Sealed floors including ceramic tile, vinyl, etc. Optically Clear Substrates: Clear substrates including Acrylic, Plexiglas™, Lexan™, lenticular lens, etc. *Note: Some substrates may require pre-treatment including cleaning with alcohol or lightly sanding or scuffing prior to adhesive application. All materials should be tested by purchaser to determine final suitability.